As technology continues to amaze me (technologically challenged), I should not be surprised to see another advancement in photography that only a few years would have only been an idea. Software has been developed that allows us to talk to our cameras. That's right, voice commands to focus, adjust shutter speeds and fstops, change ISO and more has been developed by a company called Shutter Voice. How practical will it be? I see plenty of options for use today where I might have to hold a scrim because my clients does not have a budget for an assistant. At the moment it is only available for Canon cameras. Clear your throat and speak slowly. 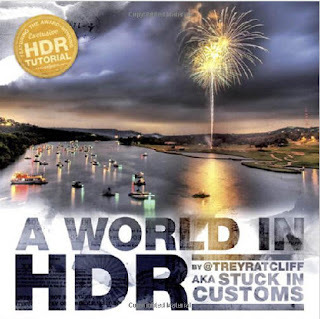 One of our training partners, Chromasia, an online leader in digital photography and Photoshop tutorials has announced their newest tutorial on digital workflow. 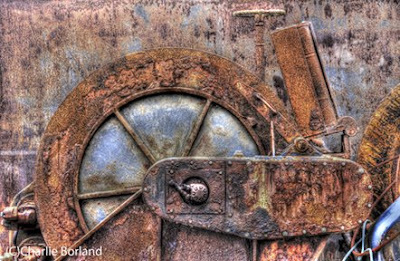 This latest tutorial is part four of an ongoing series of in-depth articles on processing digital images and is specific to ACR 5. I have read this and can vouch that it is quite informative and educational. Check it out here. 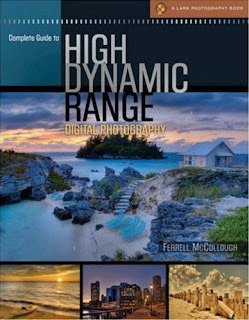 I have stated it a number of times on my blog and that is, that I'm a big fan of the products made by Think Tank Photo. They have just come out with the new Airport Addicted version 2.0 and it has a lot of similarities with my beloved Airport International roller case. You can fit in lenses up to 400 mm and also include your laptop, use the seam sealed rain cover, and tuck away a shoulder straps. These guys make fabulous products and are worth taking a look at. 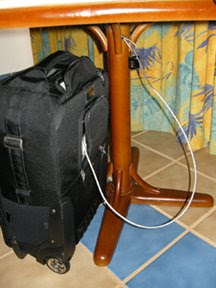 My wife and I took a quick trip to Mexico a few weeks ago and my Airport International went with me and here is a happy snap of it secured to the table in the room using the built-in cable and TSA approved padlock. This provided a fair amount of comfort because we not only were able to keep the laptop and some camera gear in their, but also our passports and wallets. If you decide to order one be sure and use our discount code WS -- 151 and they will throw in something extra. Happy shooting! And here is the rest of it. Keep Reading: Full Post and Comments! Are You Sitting There Waiting For The Phone To Ring? A commercial photography business will not be successful these days if your marketing effort consists of sitting by the phone and waiting for it to ring. 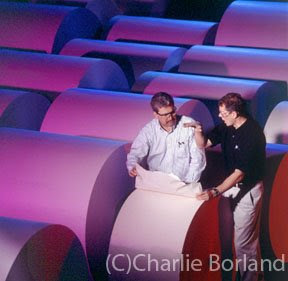 I am sure that most commercial photographers out there would agree that it's not quite like it used to be. Some photographers remain very busy while others are looking for different careers. I am one of those who agree that there does not seem to be quite as many assignments as there used to be and the ones that are there tend to be a little bit lower in budget. But there is work out there and I am fortunate to remain fairly busy. I went to Brooks Institute in the 1970s and one of my fellow classmates remains one of my best friends to this day. We compare notes about the business and photography on average every 10 days and had a lengthy e-mail conversation this very morning. This is what prompted me to blog about him and his business. He is a fabulous photographer! With the Holidays here, the opportunities for some fun holiday photography are endless. One of my favorites is photographing all the colorful lights of the Holiday season. There are homes beautifully decorated, the Christmas tree, city buildings, yard displays, and of course, your imagination. I have photographed all the previously mentioned Holiday scenes over the years and decided I wanted to photograph Holiday lights in non-traditional locations. One idea I came up with was to photograph my backpacking dome tent in the wilderness and decorated with Christmas lights. Since I enjoy snowshoeing and ski-camping, this sounded like a great idea for my annual Christmas cards photograph. I planned all the items I would need; the tent, a set of cross country skis, the snowshoes needed to get there, a flash unit, a wireless remote to fire the flash unit, 5 sets of battery powered Christmas lights, and a roll of duct tape. I stuffed all this into a backpack along with a pad, water, a headlamp, cell phone, and extra clothing. I drove up to the mountains and parked in a snow park, strapped on the snow shoes, loaded on the pack, and trudged a couple miles into Oregon’s Mt. Hood Wilderness. It was afternoon when I found this location and knew it was perfect. 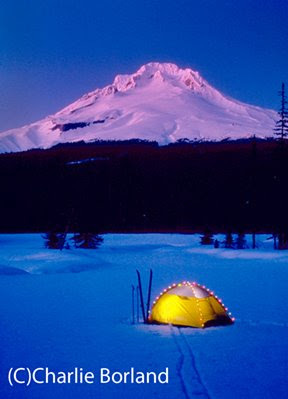 I switched to the skies to avoid large snowshoe tracks and skied over to the spot with all the gear and set up the tent. I used small strip of duct tape to hold the Christmas lights onto the tent and placed the batteries for each string inside the tent. I next set up the flash with the wireless remote and placed it into the tent. I also turned the flash to manual at ½ power to maintain flash output consistency. I then waited for the sun to set and began testing the exposures. First, you determine the best f-stop for the flash exposure and then leave that set. The Christmas lights exposure is adjusted with the shutter speed and this is where you have to balance carefully with the ambient outdoor light. Both the ambient and Christmas lights are constant light so for the scene to balanced nicely, you have to wait for it to get dark enough for the Christmas lights to be exposed correctly. Here it was about a half hour after sunset where the ambient light is dark enough that the Christmas lights showed up nicely and are properly exposed. Since the flash was pre-tested and set then it remains the same f-stop for exposure and I then bracket my shutter speeds for lighter and darker images. I continue to shoot until it gets so dark that the proper exposure for the ambient light forces the Christmas lights to turn white and lose color. I then know I am done. 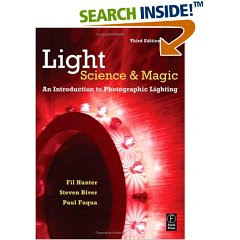 You can use this technique for any Holiday light subject and the variety of subjects is endless. With the recent crash in the economy and plummeting fuel prices, the airlines and travel agents are scrambling to fill seats and sell vacations. My wife and I decided to take advantage of a last minute incredible deal from Orbitz and headed for Mexico. Although our primary purpose was to take advantage of a lull in assignments and workshops and snorkel and explore. But as a photographer, I can only have fun for so long before I need to shoot some picture. I took along the Nikon P5100 and did some exploring through the neighborhoods grabbing some great doors and signs. 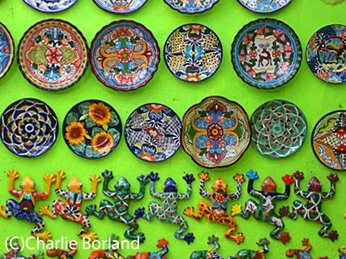 The colors of Mexico are amazing and I could not get enough. I then played in PS with these and this top image was easy. I just darkened the area under the door and sidewalk some because that was the brightest part of the scene and I wanted it to be all about the door. The Coke sign blew me away. Because it was under an overhang, I needed to lighten the top half some to even it out, straighten it with the lens correction tool, add some saturation, and then a High Pass effect set to 5. 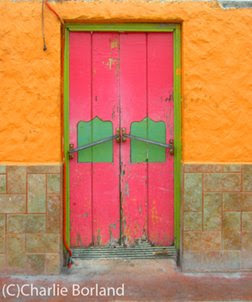 This image of the second door are two images merged with Photomerge. The P5100 could not get in any of the roof when I framed the foreground, so I shot the straight shot and then lifted the camera slightly for some roof, then merged them. I retouched the wall imperfections and then added some saturation and a High Pass set at 5. 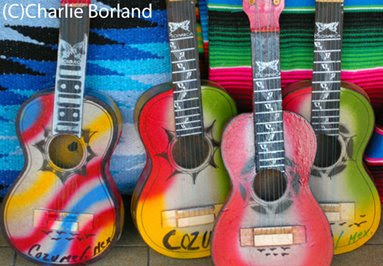 The guitars were adjusted first by a lighten layer mask to even out the lighting which was flat and overhead. 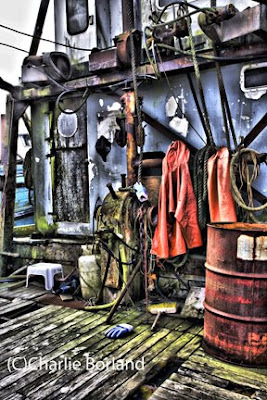 Then saturation was added. The items on the green wall were in the market and here again, I added saturation and then a High Pass, which really made it pop and lowered general contrast. 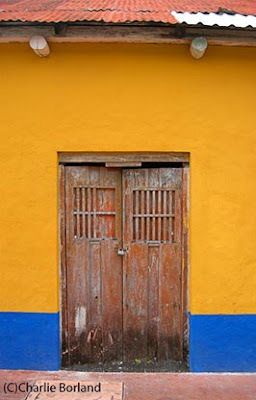 Mexico is amazing and a really fun place to shoot. Keep Reading: Full Post and Comments! Last week I conducted a workshop in Arizona’s Slickrock country with my dear friend Brenda Tharp. Based in Page, the workshop visited some of the most extraordinary geological sites in this border area next to Utah. We visited slot canyons, hoodoos, and places like Lower Antelope canyon where the photo ops were boundless and there were not too many people coming through. Upper Antelope canyon is spectacular in its own right, but word has it that they run 800 – 1000 people through there each day and that makes photography impossible. 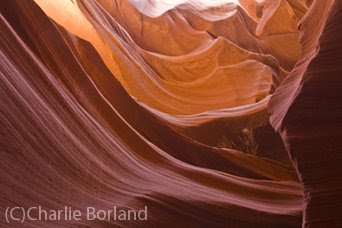 And the fee is $31 for a one hour visit while Lower Antelope was $26 for four hours, a much better deal for photography. I am having fun with a personal project shooting through windows of buildings at historic sites. 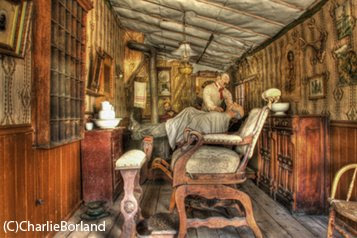 Here is the barber shop in Virginia City, Montana where I stopped to teach a workshop in September. These must be shot in HDR for all the details to show because all the light comes from the front windows so the foreground of the interior is quite bright while the rear is quite dark. I was teaching a workshop in Colorado a few weeks ago with my friend Lewis Kemper and one of our more popular stops is Silverton, Colorado. It is a historic old mining town that is now a popular tourist and ski town. It still has the old boardwalks, historic, and rustic charm as if still in the old west. Many of the old buildings are renovated and quite historic looking, but what makes Silverton a great town to shoot is the buildings that have not been renovated and all the old cars and trucks and mining equipment that are fun to shoot.Here is the front of an old tow truck that is parked next to an old garage. I have shot this old rig previously and this time I used my Canon 15mm fisheye in close and then bracketed for the HDR process. 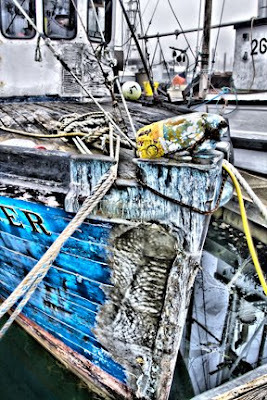 This old truck has been painted several times and the layers of paint are flaking off and then when HDR'ing it, it really saturates each layer. There were plenty of powerlines in the sky right behind it so I cloned those out. It's fun stuff to shoot, so go shoot something just for the fun of it! awhile back for her "7 Photography Questions" podcast. photographs of your kids this Halloween. definitely don't want to miss..
fun using the tips Vik reveals. learned to dread the entire picture-taking process. toddler to get him to take a good picture. photographs of your kids, or we'll send your money back." it means the launch hasn't gone live yet. One thing that I preach when I teach is the need to not just go to a clients location and take pictures. Many assignments you receive will seem easy because they just want you to come and take pictures, but I feel that every assignment is an opportunity to build photographs. We can all take pictures; point the camera and snap the shutter and it seems that many photographers get away with just doing that. But the best shooters build their photos and I do it one light at a time. Did you know... ... that this Halloween, 97% of parents will take photos of their kids and be so disappointed the next day? But you don't need to be one of them... You see, Halloween is a photography nightmare. Awful (or no) light. Chaos. Hyper kids. A million things happening at once. So, if you feel completely frustrated, dissatisfied and overwhelmed -- as if capturing the mood and your precious Halloween memories is almost impossible -- you're definitely NOT alone. Fortunately, THIS Halloween can be different. 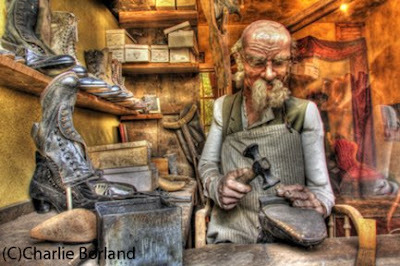 As I mentioned before, awhile ago I was interviewed by Dr. Audri Lanford from 7PhotographyQuestions.com. I recently sent her a tip that she's included in her new email series and Special Report called Halloween Photography Tips. It's a preview to a special interview called "Halloween Photography Secrets, and it reveals how to overcome all these problems. 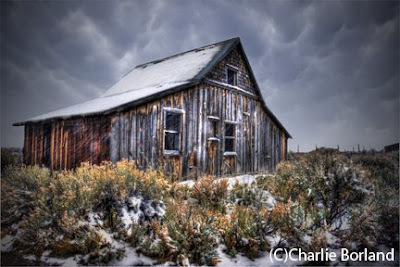 I highly recommend you check it out and sign up free now: http://www.charlieborlandnow.com/ Keep Reading: Full Post and Comments! Yes I am back and asking myself: "Why have a blog if you have no time to blog? I dont have an answer other than I am having the busiest summer in years and that is not a bad thing for a commercial photographer in our pending economic collapse. I will have plenty to blog with this fall, but thought I would post something I have been having fun with and it is shooting through windows using HDR techniques. 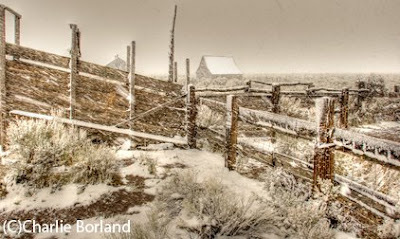 Here is an image from a ghost town in Montana where I was teaching a workshop 10 days ago. I basically rest my lens against the window and do so carefully, and then shoot a series of bracketed exposures capturing the full tonal range. Then process in Photomatix for this grungy illustrated look. I have tons more and will post more regularly, but first, busy in Colorado for the next week. Shooting adventure sports photography is certainly one of my favorite subjects to shoot as a photographer. 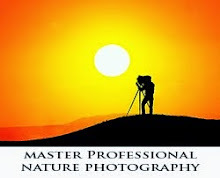 I have produced and shot many adventure subjects for stock and also joined many outdoor adventures as the photographer. Three times down the Grand Canyon as well as rafting many other rivers in the west and creating large stock photo production shoots. Here we hired models and traveled to various locations around the west to shoot. The work has been published ion most major outdoor magazines and it also lead to some sweet assignments for companies like Columbia Sportswear, Nike, Camelbak, Early Winters, and so on. 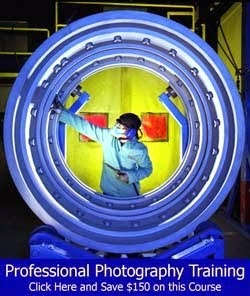 I was pleased to be interviewed the other day on www.7photographyquestions.com and about adventure sports photography. This is an interesting website that interviews pro photographers on a variety of photographic specialties. You can listen to the interview here. 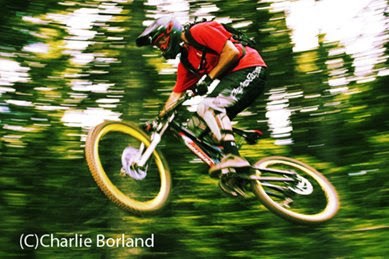 The first image at the opening of the post chosen mountain biker flying through the air. This biker was a professional mountain biker and we hired him in shooting the Camelbak catalog. Here he is going off the ramp specially built for mountain bikers and it's here in Oregon. I chose to do a blur streak affect with him using strobe. I have my assistant to my left by about 10 to 15 feet and he is holding one of my wireless flashes. This nails rider perfectly with the light. I also chose a shutter speed of about 1/15 of a second to get a nice streak behind him. The flash help freeze him in action. This next shot of the cascading stream is very easy shot to get. You do not have to go very far sometimes to get great shots that look like they're in the middle of the wilderness. Although this is in the mountains of Oregon, this beautiful creek which had lots of wildflowers in other years is right next to an old rock quarry. It's not in the middle of the wilderness. I asked her to hold real still in shot at half a second to get the nice pouring water. About six years ago I had an assignment to shoot a rafting company floating down the Colorado River through Cataract Canyon in Utah. 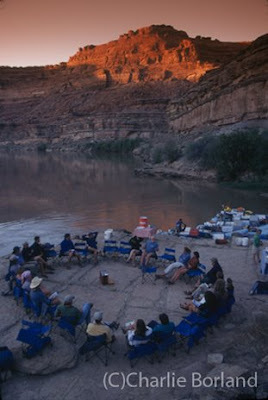 In the evenings they would circle all the chairs in camp for some great chat time. Here, I am up on the rocks and I based my exposure on the foreground area where the gathering is taking place. This would have made the sky and the sunlit rocks blow out and become white. So I chose to use a Cokin tobacco graduated filter and it brought the sky down nicely. What I love about digital photography now is that I can create the same affect without the filter spilling into the shadowed areas of the rock and thus looking more believable. I guess I need to go rafting again so I can do just that. I love to put flash in a tent at dusk. 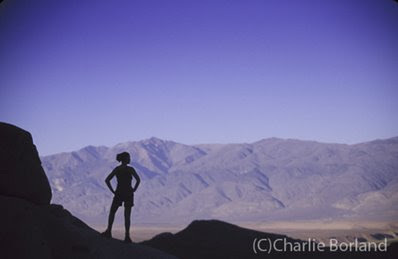 They took this shot last year while in Joshua Tree National Park in California. 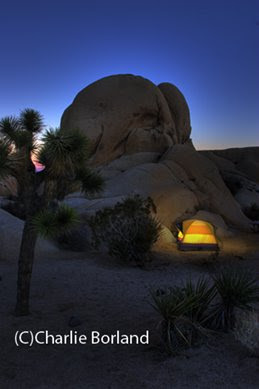 A lot of the time when I am out exploring for photographs or just walking around I'll find a spot that looks suitable for a tent shot like this and I will set it up and planted anything it's. It's very simply done. 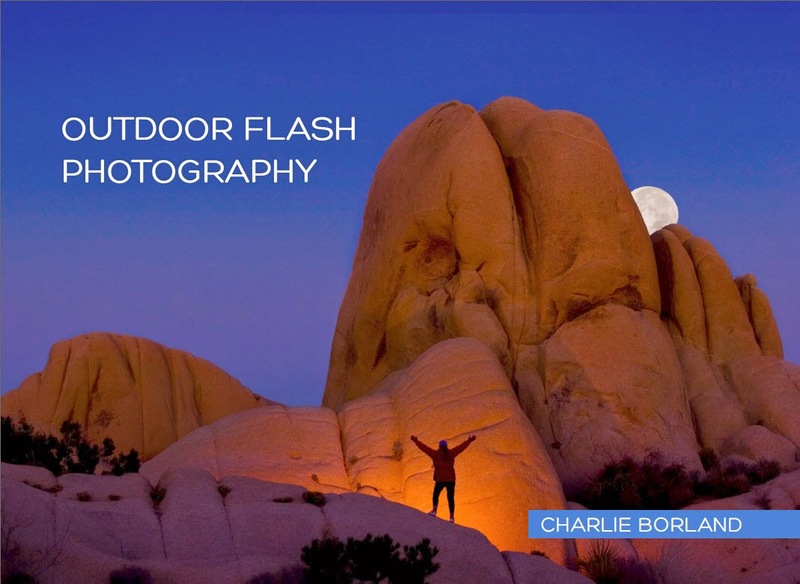 Just attach the flash to a wireless trigger and then test for the tent exposure and once you determine that bracket only your shutter speed for lighter or darker areas where there is no flash. 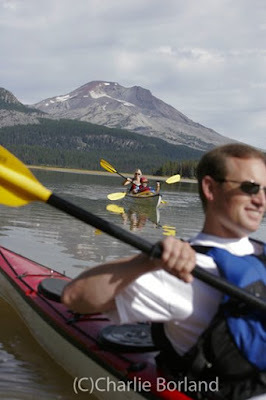 This kayaking photo was actually an assignment as well for an advertisement to run in magazines. Here I dislike it where the kayaker the foreground is running behind me and partly out of focus but he frames mom and the kids in the background quite nicely and it worked very well. 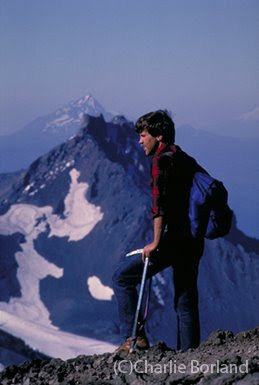 This shot of the guy on top of the mountain with his ice ax was a very good seller for me for many years. I shot it in the very early 80s and it sold very well throughout the 1980s. The problem now is nobody goes climbing in Levi jeans and plaid shirts. But it was framed and composed nicely and was on the cover of many publications. Here's a shot that is also extremely simple and has been published numerous times. We are scrambling on the rocks in an area called the buttermilk's in the Eastern Sierra of California. The sun is now setting behind the mountains and turned the foreground where we were into shadow but the light is still hitting the desert mountains across the Valley. So it makes a perfect silhouette location. And she is placed in one of those compositional hotspots that we learned back in photo 101. Anyway, adventure sports is really fun whether you are participating in this activity or observing it and photographing it while it happens. Keep Reading: Full Post and Comments! Geeezz, I am slammed and finding the time to post has been tough this month. 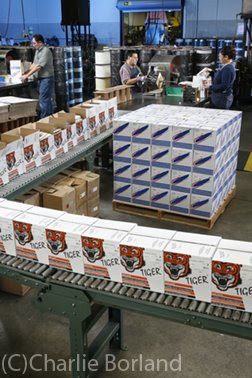 But as most commercial photographers know, it will slow down at some point. It always does. 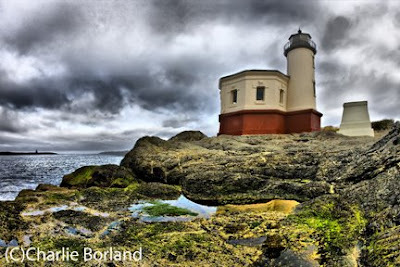 I just wrapped up my Oregon Coast Digital Workshop and what a blast! I very well had the best group ever. They were enthusiastic and eager to learn and do lots of shooting. We had fabulous weather: mostly sun and one afternoon of rain and that is it. That is great for the Oregon Coast by the way. 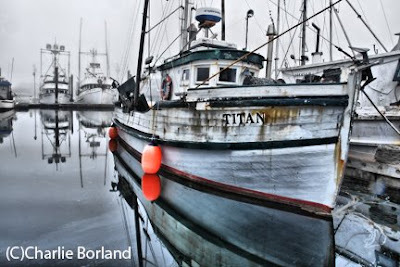 We also had two foggy mornings at the Charleston boat harbor which makes perfect conditions for shooting. 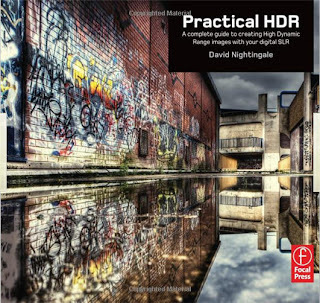 As I always do in these Art of Digital workshops, we cover photo 101, masking, ACR, optimization, and for fun, some HDR. The boat harbors are great for that technique. 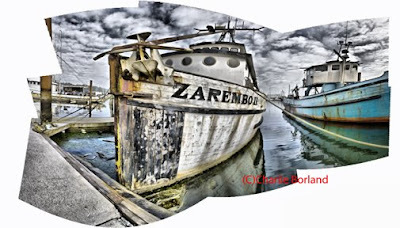 The opening image is the boat harbor and it is the Photomerge collage technique mentioned in a previous post. 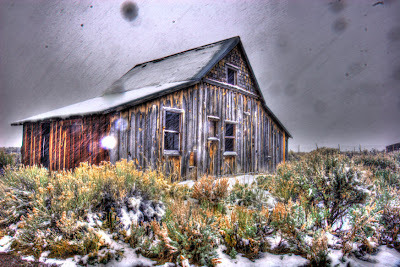 I then HDR'd it using a program that one student introduced me to. It is ReDynamix by Media Chance and is a Photoshop plugin. Most of these images were created using ReDynamix and its HDR effect, which should really be called the Grunge look using HDR techniques. You can hardly go wrong with the price, they only want $16 for the plugin. The biggest problem is it only works on 8 bit images and that is a big minus. I played long and hard with it and my opinion is mixed. While is does give a good Grunge look and easily, about the time you start getting that look the noise jumps in. And continuing to push harder gives even more noise to the point of being unusable. I have tried variations of Noise Ninja to attempt to control it and will continue to experiment more. 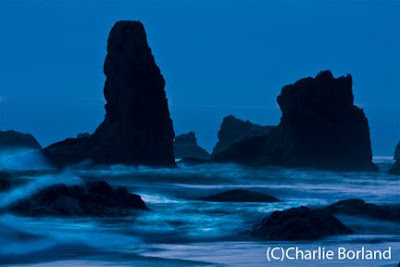 This image from Bandon where we shot the sunset, uses a favorite technique I like. The idea here is to stop all the way down for the longest exposure and then the waves blur. I generally like to do this 30 minutes to more than hour after sunset. I like the shutter to be open for 30 seconds to allow the water to blur a lot. Here I am at 1/8th second at f22. I open the image in ACR and optimized the image, then made another dodge burn layer and lightened the edges of the waves that essentially are white in the sunlight. I was very attracted to this float on the bow of this boat and pointed it to my students. Here I used ReDynamix pushing the sliders for 'the look'. 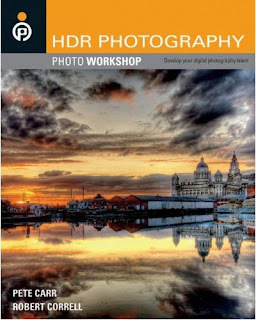 One problem with HDR techniques is the noise that is created in the sky when you start pushing the technique. In this image using ReDyanamix, the sky very quickly goes noisy. One solution I use, although not with this image, is to mask in a separate sky. So I shoot a separate sky and then blend them in layers and each image is processed differently in the software to reduce the noise. I'm thinking this is an old winch off a fishing trawler and has been sitting here a long time. 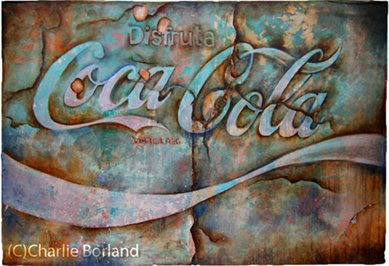 It is totally rusted out. I found this at the back of someones back yard while scouting for the workshop and stopped and had to shoot it. 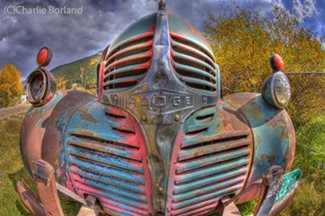 I used Photomatix for the grunge look, had to do some burning and dodging and sharpening for the final look. 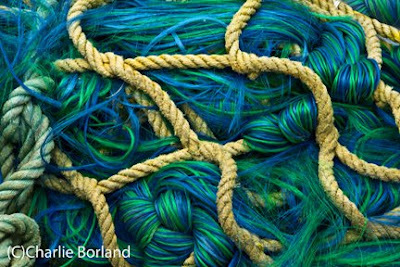 I had not seen this turquoise and blue fishing net before and this big pile made for a great and colorful shot. This lighthouse was shot with a 15 mm fisheye and I also used the HDR look for it. It got noisy quick so I had to back off. I then added the optimized RAW file and stacked it on top and painted back in some of the lighthouse to look normal. Then used Transform> Skew and some Liquify to straighten the lighthouse which suffered from the fisheye look. I loved the back of this boat and pointed it to my students as well. 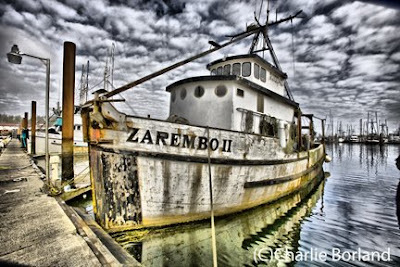 A rusting, rotting hulk of a fishing trawler with moss and grass growing on the wooden deck. How could the owner let it literally rot away? It made a great subject! So it was a great week at the coast with some great people and some fun images to play with on the computer. But now, I am off to a month of great assignments. Stay tuned! 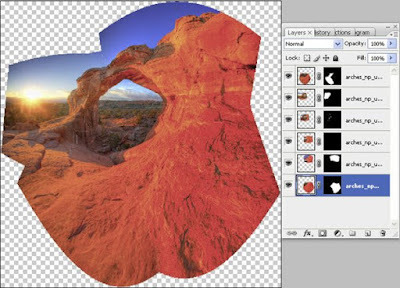 Stitching panoramas and multi-image composites has never been easier. 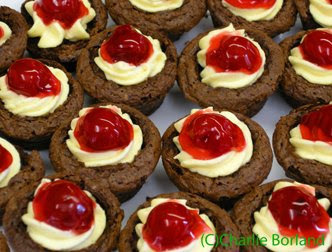 The Photomerge feature in Photoshop CS3 has made this a piece of cake. 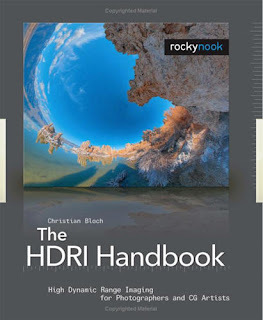 In fact, the days of carefully leveling the camera, nodal points, and extensive stitching are over, at least for me. Of course, this news is not new as this feature has been well covered since the release. What I have been having fun with is moving beyond traditional panoramas that are wide and narrow and instead creating panoramic collages. 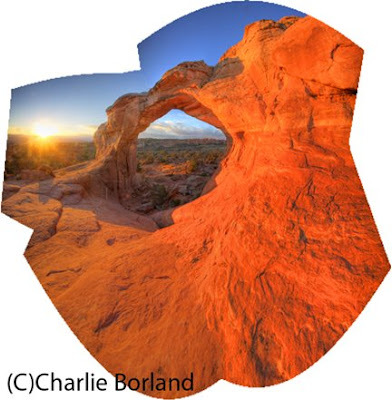 This image is Broken Arch in Arches NP, Utah. It is shot at sunrise and was taken during one of my workshops there. 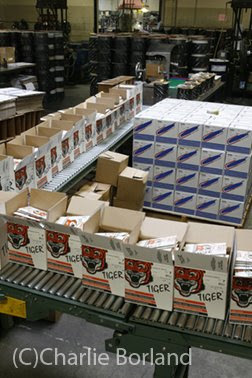 The image not only goes left and right as far as individual frames, but also includes looking up and down across the field of view. Read on to see the PS layers. When I am shooting this I am not shooting a leveled camera so that I have in essence, 3 across the top row, 3 across the middle row, and 3 across the bottom row. You certainly can shoot that way and you end up with roughly a square image. Instead, I am basically just shooting (in many cases, hand held) to make sure I am overlapping each frame. I try to overlap about 20% between each image capture generally. But with this hand held technique it is tough to be super precise. So I start at one of the pano and start snapping, then raising the camera up and cpature above that first capture, then drop down below the first camera position. Then I move to the middle area and shoot more, but here I may begin to skew the camera angle meaning I am purposely not keeping the camera levl and may actually rotate it slightly. In this image was I started on the left and then captured more frames raising the camera and lowering it and rotating it some in others. It is distorted substantially because of the 17 mm lens I used really enlarged the foreground and right side of the frame. I then open all these frames in Adobe Camera RAW and make a few adjustments and then hit Synchronize to apply it to all of them. Then I open the Photomerge tool to create the composite. The cool thing about Photomerge is that is will blend, align, and even change perspective to 'collage' these frames together. Once you hit OK the files are composited and PS creates masks that show and hide parts of the image. What has also worked pretty neat is that you never know what you will get as the process is pretty random in regards to what it shows and what it hides and especially the perspective and how the changes are unpredictable. I do not know if I have any commercial clients that would ever want anything like this, but you just never know. 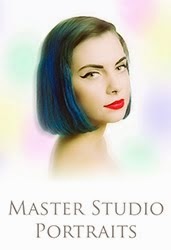 I could play all day with these fun and experimental techniques, but I got a studio and business to run! Gotta get to work. Keep Reading: Full Post and Comments! 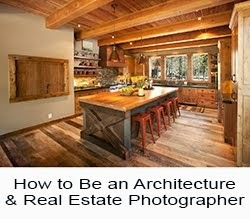 A few weeks back I posted about architectural interiors using Photomatix and if using it could replace the lighting of interiors and shooting with traditional methods. Although I believe that most interiors certainly benefit from artificial light to accent the interiors, there may be times when using lights are not an option. Shortly after that post I received an assignment where adding lighting was not possible. My client builds a variety of projects in hospitals and other commercial projects and they needed pictures of a hospital and another medical clinic. These facilities were fully functioning with staff and patients and the thought of using lights was to much of a distraction and interference. I love to light! I enjoy the challenge of using supplemental lighting to enhance and improve the scenes, no matter what they are. I think we as photographers and creative pros can do amazing things with lighting and we also have an obligation to do just that for our clients. Some projects we are presented will require us to use other means to achieve the best result when we can do it the way we want. The clients expect us to be problem solvers. So here I am with this client; they have never used a pro shooter before, have no clue what goes into great interior photography, and want to spend as little as possible. I was successful at convincing them that pro photographers are worth the cost and had the examples to show them the before and after, convincing them that they could not do this themselves. I asked if we could use lights. They called the facilities and the answer was NO. 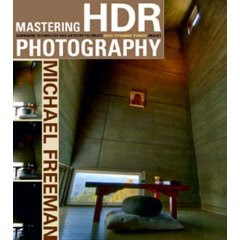 Fortunately I have been using Photomatix for the last year and a half or so and my buddy at Chromasia guided me through the early stages. Well, this was clearly the answer for this assignment. 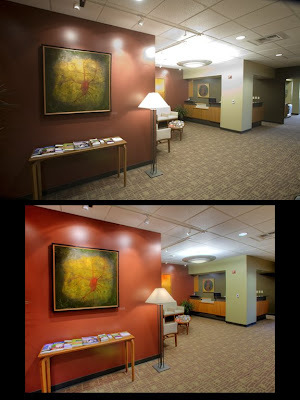 This is one of many images from that day and and shows the before and after. I will post more as I get them processed (still waiting for client decisions). It took 11 exposures to create this shot because that was the range between open shadows and the highlight from that ceiling fixture. I then took the image in PS and set black and white points, adjusted color balance, and tweaked curves. It still needs a little more work, but this is close to complete. 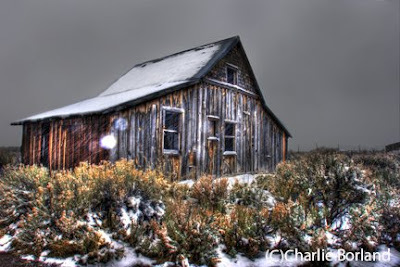 Photomatix is clearly worth mastering! span> Keep Reading: Full Post and Comments! 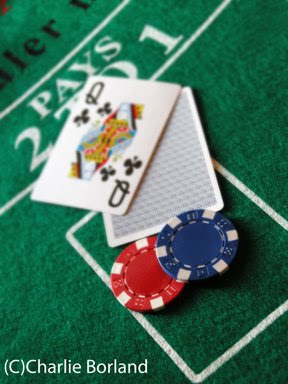 It was my buddies birthday on Saturday and his wife threw a big party: it was Casino Night. 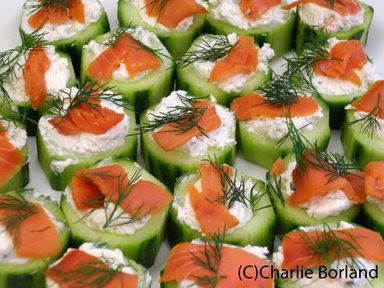 They rented all the stuff to throw a gambling party, ordered a big barrel of beer, and lots of fabulous snacks. It was a great time! As a pro shooter, I am always on the lookout for a great stock shot when out and about with my pro gear and as such, I am working. After work I never touched a camera no matter where I was. But since I bought the Nikon Coolpix P5100 last spring after teaching alongside Joe McNally, David Hobby, Chase Jarvis, Bobbi Lane, and other fabulous folks, I carry it with me everywhere and it has opened my eyes to looking for everyday snaps of life around me. Stock photography has transitioned immensely since I got into it 30 years ago and today's look is a lot more like snapshots. Less stylized, less setup, and more real people doing real things. So having a camera that fits in the pocket and is 12 mega pixels makes the whole approach to stock a different animal. My nephews birthday is coming up and he'll have a cake and blow out the candles. I shot a big production of this exact subject years ago. It was a major production, but I believe in today's stock photo market the happy snap from the family party will sell better. 10 mega pixels is about the minimum for today's agencies, so the Coolpix produces just enough resolution for a marketable images. 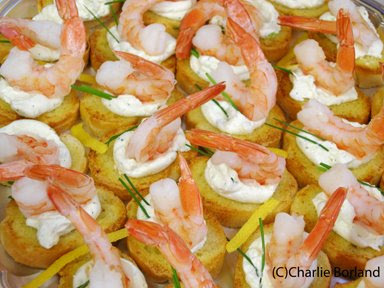 Back at casino night, I lost all my money (Monopoly) as usual, but got a few nice shots of the food and gambling. Keep Reading: Full Post and Comments!